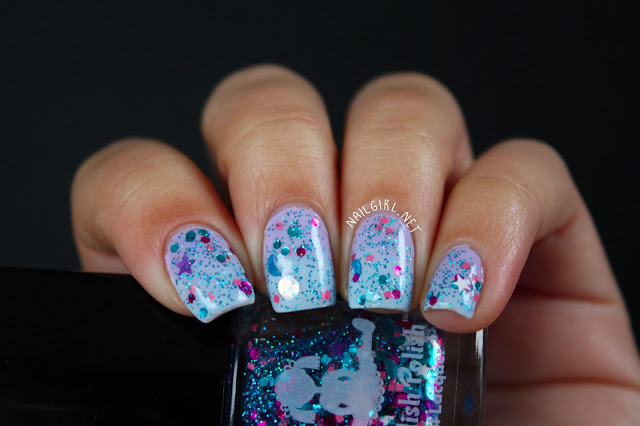 I'll be reviewing Dollish Polish's creation known as Crystal Empire from her Cartoon Collection. It has a clear base with a stunning combination of "...Stars, Moons circle & square glitters in shades of Pink, Purple, Fuchsia, Turquoise, and White all in a clear base that can be layered over a variety of shades to make one bewitching manicure!" I might mention that the circle glitters are holo, which added a really lovely effect. I chose to wear 2 coats of it over a gradient of Illamasqua Wink and Essie Borrowed and Blue. Some of you may be able to tell I did this mani a little while ago as my nails are no longer square, they're much rounder now. I found that I did have to fish a little bit for the larger glitters, but it wasn't too much trouble. I applied one coat of Gelous before my usual top coat to ensure it was smooth. Overall, I am SUPER stoked about how this mani turned out and might do it again with my nails rounded! The gradient is so soft and pretty! That glitter is gorgeous and your gradient is beautiful! !